Hurricane Florence continues to threaten the Carolinas and Virginia. How are you praying? Click through to share. Here are the prayers of some of our intercessors. Leave a comment to share your prayer as well. Michael: Prayers for supernatural protection and safety in the name of Jesus Christ. Jen: We take authority over this storm and we speak a cold front to over take it and run it out to sea, in Jesus name. Diane: Prayers that God will cause the storm to diminish. In Jesus Name! Julie: Praying that it will stay out to sea and protection of land and all people in its path for safety. Ron: What did Jesus do with the storm on the Sea of Galilee? He said we would do this and greater things! Take up your authority, Saints! Speak to this mountain! Florence, we command you to disperse! Winds cease! Rotation, be still! Dump all your rain in the ocean and do not harm or flood the mainland! Thank you Jesus for the authority you have given us to steward. Help us to be good stewards! Elbert: Thoughts and prayers for all those in the path of this storm, praying may God bless and protect! Candy: I take all authority over the power of the enemy and I rebuke this storm. I curse the words that give it strength and I bind fear, anxiety, and panic and send them to Jesus. I release the Hosts of Heaven to tear down any strongholds and platforms used to operate from and I command the storm “to be still.” In Jesus name and through the authority He has given us, Amen. These prayers and thousands more are being said for those of you in the path of the storm and flooding. Know you are being prayed for! PRAYER: We have created a prayer guide that is helpful in times of crisis–sometimes we just don’t know what to pray, or how to pray. This guide is practical and will help you focus your prayers on Scripture, the wider picture of the crisis, and for those in need. Download HERE. Father, I pray that your Word, the Holy Spirit, and “Jesus the Anointed One” will minister to those in need, affected by this storm. Lord, strengthen those in need. May the Holy Spirit intercede for them in prayer for guidance, and comfort In Jesus Name we pray. Amen. Lord, we trust and thank you, in this crisis, we know that you are still God. Comfort and send your peace and provision in the name of Jesus. Amen. Father, we speak hope, strength, courage and protection for each one affected by this hurricane. Draw people closer to You, and closer to each other. We thank You for the outpouring of support and provisions from so many for each one. We thank You for our first responders, many of them had to leave their families to care for others. Keep them safe, well, and healthy. We thank You that You are there with everyone, revealing Your love and power. Bring men, women, boys, and girls to faith in You during this time. In Jesus Name we pray, amen and amen. Father God Almighty, we come before you humbly as thousands are undergoing heartbreaking challenges during and after this storm. May you use this as a wake up call for all of us, including those in the midst of the storm, to recognize you in all your sovereign power, and to see Jesus Christ as redeemer and friend. As we humble ourselves before you, you will lift us up. Please equip first responders with extraordinary strength as they reach out to everyone in need. Thank you, Jesus! Father God thank you that you hear the prayers of the people in the storms path. We pray with and for them, cover them with your protection and grace to come through in Jesus’ Name! We loose the Host of Heaven to battle in the spiritual realm to stop this storm, to weaken it to a depression and move it back out to sea – away from the land. We decree No more fatalities and no more damages. This is impossible! Yet all things Are possible for you Lord!! We decree it and say YES in Jesus’ Name! Yours is the Power & Authority, and we your people say Yes! here on earth!! Amen & Amen. We thank you & Praise your Name Jesus – Lord of Heaven & Earth! God Reigns! that is the only truth. God, you are supreme Lord over all and in your holy Name we plead the Blood of Jesus over all the people and over all the territory in those areas being affected by this hurricane and by storm surges, winds and flooding. The Blood of Jesus protects them, and I agree and say Amen! From Anthony M. Lee Brackett. May the Lord bless Anthony’s prayer and bring quick recover to all those encircled by the hurricane and please spare their lives all for the glory of your name, Jesus the Christ… Amen Anthony Brackett. 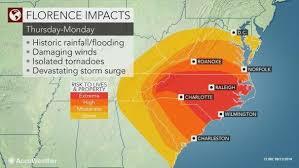 Please stop the storm and the surges and protect the people and homes of North Carolina, South Carolina and Virginia. You have this storm and all the vulnerable people and children in the Palm of your Mighty Hand. You are our Savior and Protector! We cling to you for our safety and support. You are our King and Deliverer. Spare these states from destruction. Stop the surges and rain and wind. You are Mighty!!! We’ve been praying that the storm went back into the ocean and dry up. I’ve been praying with CBN and KCM. This storm has dropped from a 4 category to a 1. It’s still going to damage several states with flood waters so we need to get this storm stopped now before it does damage. The Lord said anything we ask believing we’ll receive. I believe and if some will stand in agreement, we’ll get this storm stopped. Maybe the people in these States that are endangered would recommit themselves to the Lord. Thanks for your prayers! We are standing firm in God’s word(Psalm 91). Pray you guys are all okay, safely kept in His care. Isaiah 4:6 (actually all 6 verses are great!) you may know this but it literally was an eye opener for me. We know God protects via a pillar of Fire by night. A Cloud by day. But I never saw (Isaiah 4:6b) God Himself protects us from RAIN + STORMs!!!!) yes! Praying Gods most holy/awesome word over you everyone in the east coast. Found this during Lane / Hawaii, God rose up against it, return upon the heads of those who manipulate such evil. His protection of His own manifested!) Our GOD HE is very great!) Prayers are at an all time high, it is all HIM! Thank you Lord for hearing our prayers; for speaking to the wind and the waves and rescuing those in harm’s way. Use this hurricane and every means to turn the hearts of men and women back to You. May Your Spirit wash through our nation and Your church to bring conviction, repentence, deliverance and salvation. Lord God I pray that you calm the storms, winds, rain and waves. Lord God, you are in control. Protect the people that are in the midst of these events and keep all emergency crews safe. In the Mighty Name of Jesus we pray all these things. I speak over Florence DEMOLISHED in the Name of Jesus, I Decree Flourish in the land of Carolinas and Virginia that this storm will guided directly to the end of the oceans in Jesus Name. Praying for the LORD’s merciful hand over all & that many might turn to Him for salvation/and or renewed faith & trust. Also revival for our Country, repentance for our apathy, harden hearts. I am asking our Sovereign Lord to push this storm back out to sea. Also for safety, esp for my grandson who is in SC. And Jesus stood up in the boat and commanded the wind/waves, “Peace! Be still!” In the name of Jesus, who gave us power and authority over all the power of the enemy, we have commanded that Hurricane Florence be dissipated and will come to nothing. “In the name of Jesus, we command the millibars to rise and a high pressure system sit on that hurricane until it is downgraded, downgraded, downgraded and comes to naught. As it has now been downgraded, we command the storm and winds to be still, and the flooding to stop and the waters to dry up.” God set boundaries for the sea: “The proud waves can go this far and no further.” To the Hurricane, we declare “You will not destroy people, property, or land; you will come to nothing!” We thank you Lord that you have heard and answered our prayers.” See Kat Kerr’s facebook page to learn how to take authority over storms. God came to give life and life abundantly. Satan came only to kill, steal and destroy! Abba, Father you know best what to do with weather. I ask that you have mercy to those that are calling upon your name. I know that you are full of mercy and love and I ask that you especially take care of the children and elderly, saving lives and helping them in this time of fear and stress. Let all of this be turned for our good in Jesus Mighty name. I thank you Abba for hearing our prayers. Father, you are God and God alone. You are our source. Father I ask that you touch each and every person being affected by theses storms and hurricane. If they don’t know you and the pardoning of their sins use this situation to bring clarity of how precious life is and of who brought it and bought it back for us. Do the unusual thing Father. Get the attention of those who would not normally look to you. Protect your people Father. I thank you for your hand of mercy upon those who are putting their own lives as risk to save others. Father, I thank you for local and federal agencies working in tandem to provide any all services needed for the people. Father I pray that they find those who may not be easily assessable to a road or neighborhoods, those that are hidden. I thank you Father that they will be found and rescued in Jesus’ Name. We plead the blood of Jesus over this situation, over North and South Carolina. I thank you for your answered prayers from heaven Father. Thank you, we love you. Blessed be thy name O Lord, Our God forever and ever. IN Jesus’ Name, amen.